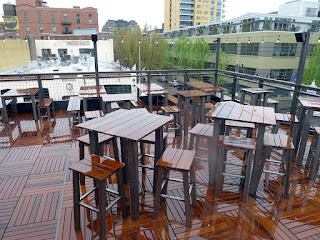 Make no mistake, 10 Barrel's new rooftop patio will be a gigantic hit when the weather eventually decides to cooperate. 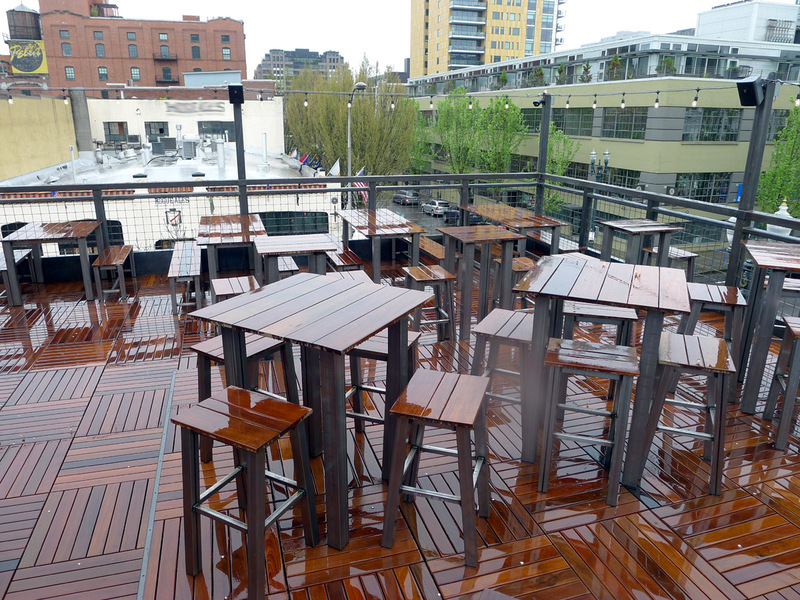 In peak season, seats on the patio, which sits atop the Pearl District brewpub, will be one of the toughest tickets in town. Trust me. The 10 Barrel folks invited an eclectic bunch of media folks up to see the new space Monday evening. As fate would have it, the weather sucked badly. It was raining and quite chilly, which put a bit of a damper on the event, despite the complementary food and beer. Views of the Pearl and West Hills from the rooftop perch are exemplary. That's going to be a nice selling point. 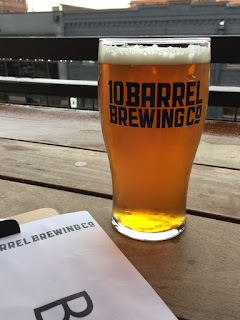 One of the hosts reminded us that patios are in 10 Barrel's DNA, as the places in Bend and Boise both have the amenity. They spared no expense here in Portland. It wasn't mentioned Monday evening, but I seem to recall that putting the patio on top of the pub required costly structural enhancements that delayed the entire project and pushed back the pub's opening. In fact, it was during the construction delay that 10 Barrel was gobbled up by Anheuser-Busch. That was likely a convenient turn of events because it allowed them to move forward with the project without serious regard for cost. Great problem to have, right? There are 80 table seats and 8 bar seats on the patio, which comprises a little less than 1,600 square feet. 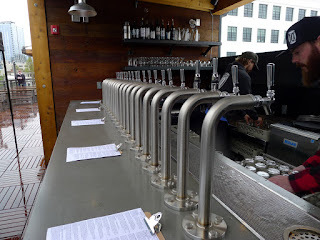 The bar will feature 20 taps pouring essentially the same beers that are being poured downstairs. It's plain to see that they paid attention to fine details with the beer and with the pub, generally. Hey, they could afford to. As for the beer, you aren't going to find a better beer list in town. Head brewer Whitney Burnside, wooed away from Pelican prior to the AB buyout, is one of the most accomplished brewers in the city. There may be naysayers due to the ownership situation, but that's a crock. The variety of well-made beers here is similar to Breakside, regarded by many geeks as best in the city. Of course, the elephant in the pub (and on the patio) is Anheuser-Busch. As anyone who stops by here knows, I am not a fan of AB and it's anti-competitive, evil practices. They're buying up craft breweries so they can brew a few key brands in factory breweries and flood the market, the idea being to hurt independent craft brewers in the grocery and convenience store channel. Their strategy with the pubs is different. With 10 Barrel, a generic name unconnected to place, they will open pubs in key cities. They already have pubs in Bend, Portland and Boise. There's one opening soon in Denver and they hope to open one in San Diego, if opposition doesn't stop them. I think Seattle and the Bay Area will get pubs at some point, and other cities will follow. The big idea is to build brand identity for AB-owned craft brands regionally and nationally. That brand capital will then be used to squeeze craft brewers in stores and on-premise (bars, restaurants, etc.) settings. The Budweiser folks, despite their money and experience, do not get brewpubs. They bought 10 Barrel, Elysian and others to show them the way. 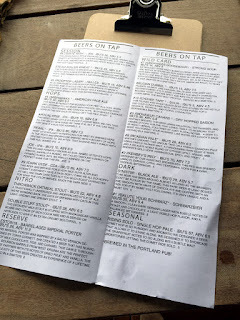 If 10 Barrel Portland is a good example, it appears the pubs will have some level of autonomy. Sure, I've heard stories of micromanaged beer recipes, but the proof is in the (beer) pudding, and Whitney Burnside's pudding is good as gold. I turned down invitations to 10 Barrel events prior to Monday evening. I did so on principle, Why should I attend an event when I know I can't recommend an AB-owned pub? Some of my peers, evidently oblivious to the concept of principle, claimed I was making assumptions without knowledge. Not at all. My view of 10 Barrel is based strictly on ownership. Nothing more. I chose to attend Monday evening because I thought it was perhaps time for me to see the sights. A trendy, new rooftop patio seemed like a good reason for a visit. But my opinion of 10 Barrel and Anheuser-Busch wasn't going to change. Zero chance of that. Along those lines, it's interesting to note a disingenuous statement in the event press release: "10 Barrel Brewing Co. is a Bend, Oregon-based brewery with a simple mindset..." You see the problem, right? 10 Barrel was originally based in Oregon. Today, it's based in St Louis or Belgium or Brazil. Take your pick. But they'd rather obscure that detail. Not the best. Of course, plenty of people don't care about the ownership situation. They like 10 Barrel and aren't worried that Anheuser-Busch is a threat to independent craft brewers. That's fine. If that's your mindset, by all means jump on the 10 Barrel bandwagon. Enjoy the rooftop patio while you're at it..if you can get a seat up there. It won't be easy once better weather arrives. But I won't be supporting 10 Barrel. And it isn't personal. As I told a writer friend, I refuse to beat up the pub or disparage the folks who work there, regardless of their position. These people are doing good work. The beer. the food, the space and the service are top notch. It's the corporate parent I have a problem with. I don't want to give them any of my money, which hardly matters since 10 Barrel is busy enough that they don't and won't need it. Nice post, Pete. More civil and balanced about it than I probably would have been.